parked the car at lough acorrymore and headed up croaghaun last wednesday with the intention of finding bunnafreva west. The first time i climbed croughaun was back in 97 and i did'nt know then of the loughs existence. 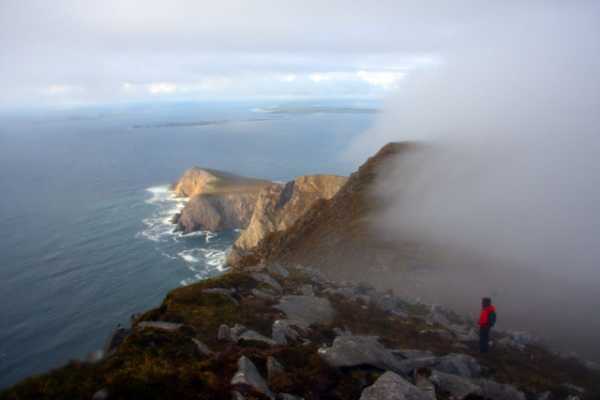 we climbed around the lower north east shoulder of the mountain with the intention of walking up the ridgeline to the summit and having a look at bunnafreva on route but just when we reached the loughs location thick cloud came in and we could'nt see anything. It was a strange feeling standing at the edge of the ridge, all i could see was several rocks for a few feet down and then thick fog, you might never have realised it was over a thousand feet to the atlantic ocean directly below. i was pretty sure the cloud would lift and after an hour of waiting around, getting soaked in two showers, nearly getting blown back down the hill and half frozen into the bargin, the cloud lifted and we got a fine view of the incredible lough.It seems to hang precariously, being so close to the cliff edge. we then followed the ridge to the summit in about 45mins, the views down to saddle head are breathtaking and the line from the summit to the ocean half a mile below are something else......its not a mountain for the faint hearted though and extreme care needs to be taken, many parts of the cliff edge are broken and ready to plunge into the abyss! !